The debate between hang-on stands and climber stands has been an ongoing topic. Depending on your goals and environment, each stand has its advantages. Climber stands allow you to quickly scale trees. They are great for quickly switching spots upon seeing game. They are easy to take down and very mobile. Climbers are designed to be very comfortable, often loaded with soft padding. Climbers generally require a perfect tree (one that is smooth and straight) to be effective. Hang-on stands, on the other hand, are great for staying in one place. Having multiple hang on stands in one area is the most effective way to quickly use this type of stand. Hang on stands are great for long waits, they allow you to really get in close with the tree and blend in with your surroundings. They allow you to have enough room to move while still being silent. Once the stand is up, getting in an out is virtually soundless. This is why having multiple ladder stands in one area is a great strategy for getting the best positions on game. Ladder stands are great at getting a good grip on oddly shaped trees. Depending on what type of trees you have in the area you’ll be hunting, this could be a quality that makes a ladder stand the best hang-on tree stand for you. Both hang on stands and climber stands have general qualities to take into account that make up the best stands. The materials, features and how well it adapts to your situation will help define the best ladder stand for you. The following hang on tree stands are all high quality stands – If you’re looking for the best ladder stands these 3 should be among your consideration. This hang-on stand from Guide Gear offers great value for the price. With a 300lb weight capacity and a design that gives you full range of motion, this is a versatile stand. 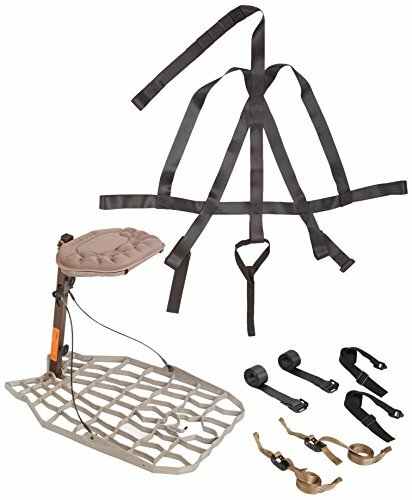 The Guide Gear Deluxe Hunting Hang-On Tree Stand focuses on comfort while you’re sitting and waiting. The platform is sized at 24 x 291/2”, composed out of thick, padded mesh. The suspension style seat measures in at 17 x 10” and has a padded camo design. The backrest, arm rests and chair are fluffed with padding for added comfort. For support, the platform features strong cable supports, a FAS safety harness and 2 ratchet straps. Some users say this stand is kind of hard to assemble. People have noted that the instructions aren’t the clearest and you need to be intuitive to get this put together. Some packages have also been noted to be missing tools for assembly. Some troubleshooting may be needed for new users. Some people also recommend getting additional ratchet straps for added support while hanging. Another gripe with this stand is the quality of the metal isn’t the best. Users have noticed this stand to rust faster and easier than other ones. Overall the Guide Gear Deluxe Stand is a solid stand for the price you’ll be paying. It has all the features of a quality fixed stand and will allow you to start going out while still on a budget. Perfect for a throwaway stand, a cheap replacement or to leave hung up somewhere. This all-aluminum hang-on stand weighs in at 14lbs. It features a quiet and easy setup and comes with 2 receivers which make for faster setup and take down. This is a very portable stand that folds completely flat and is easy to carry. The platform on the Millennium measures W20″ D38″ and the seat at W20″ D17″. The stand boasts high quality materials for the seat. It’s covered in a black UV resistant material, which is also scent and moisture resistant. It also has a seal for the moisture, a high quality seat for all weather elements. For support, the Millennium has a TMA certified full body harness. The only con about this stand is how some of the aluminum parts are exposed. Users have said the sound of something banging against the aluminum is extremely loud and inconvenient. 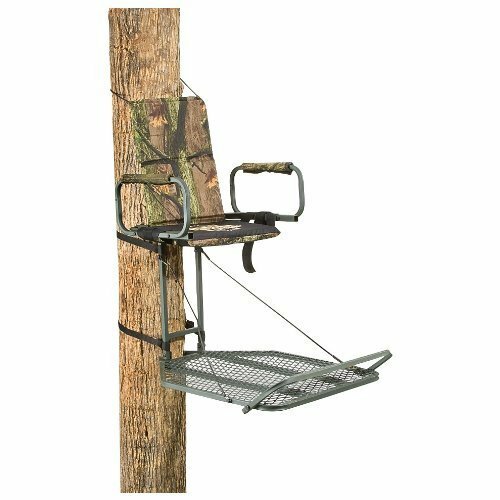 Overall this is a high quality stand for the price, it can easily stand among the best hang on tree stands for this price. Most people have been unable to find a stand this good in this price range. The versatility of this stand makes it well worth a buy and the quality of its construction ensures your investment. At this price, this is the best ladder tree stand you can get. The Lone Wolf Alpha is a lightweight, high quality stand crafted with the latest technology. Although slightly more expensive than other similar options, most hunters report this stand to be well worth it as it will last for many seasons. The Lone Wolf Alpha II is a very comfortable stand. The large seat allows you to level the platform & seat separately, so you can get the best position. The stand also has a built in bow holder to rest your weapon for added comfort. 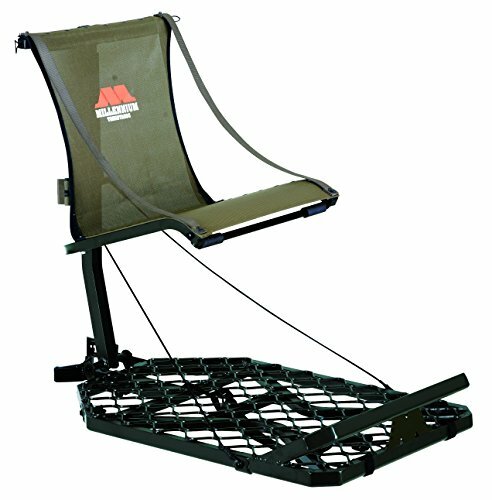 With the 350lb weight limit this is a comfortable stand for hunters of all sizes. This is an extremely versatile stand that is able to accommodate oddly shaped trees. Most users say this stand does a great job at getting good position on weirdly shaped trees. The Lone Wolf is optimal for trees between 4” to 22” in diameter. The Lone Wolf Alpha is a very mobile hang-on treestand; it folds flat and has straps for easy carrying. This stand also has a camo patterned grid design that allows the stand to blend in to your surroundings. The only thing wrong that users have to say about this stand is how the metal buckles are too big. Sometimes they bang against each other and make a lot of noise. Some hunters are recommending covering the buckles in bike tubing. Overall the Lone Wolf Alpha II is a solid investment that will show its worth in how long it lasts. A quality buy for people looking for the best hang-on tree stand in this price range.